James BROWNE (1605 -1676) was Alex’s 10th Great Grandfather; one of 2,048 in this generation of the Shaw line. James Browne was born in 1605 in Southhampton, Hampshire, England. His parents were JOSEPH BROWNE and Sarah [__?__]. He married Judith CUTTING about 1637. After Judith died, he married her sister Sarah Cutting in 1646. in Charlestown, Mass. He lived in Charlestown until about 1660, then moved to Newbury and finally Salem as early as 1672. James died on 3 Nov 1676 in Salem, Mass. Will dated 29 Jan 1674, probated 29 Nov 1676. James Brown and his son were glaziers. 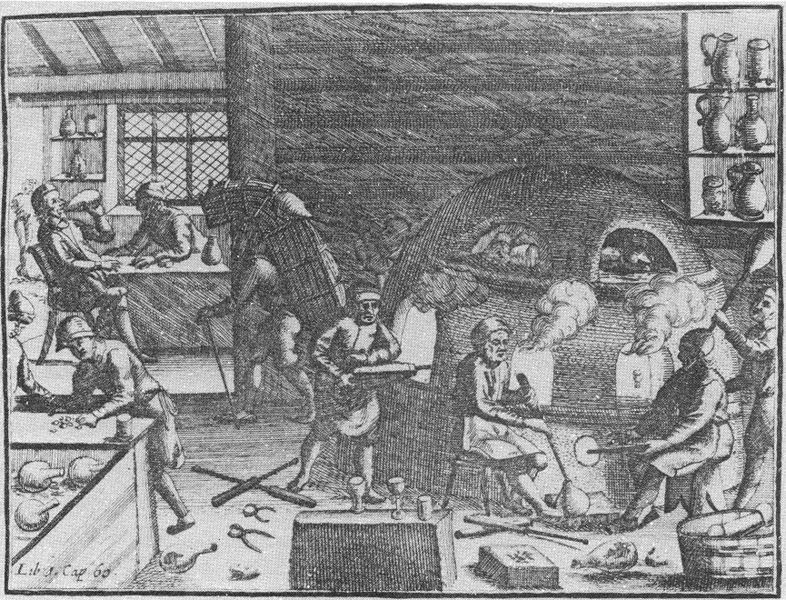 Work consisted of glass-blowers, boiler men, glaziers and glass carriers. Judith Cutting was born in 1616 in Ipswich, Suffolk, England. Her parents were Capt. John CUTTING and Mary WARD. Judith died between 1643 and 1646. Some researchers don’t believe a 17th Century man would have married his wife’s sister and think that this must have been a different Judith. See Walter Goodwin Davis’ analysis at the bottom of this page. James, the glazier, was admitted a freeman May 17, 1637; hired Lovell’s Island of the town of Charlestown in 1636 and must have been of age at that time. He removed to Newbury where he was one of the proprietors in 1637 and was elected to various town offices. He removed again to Salem. He deposed December 29, 1658, that he was about fifty-three years old. That would make his year of birth 1605, and that is probably correct. He died at Salem, November 3, 1676. His will was proved November 29, 1676. bequeathing to wife Sarah; brother Nicholas Noyes; children, John, James, Samuel, Abraham, Anna, Mary, Abigail, Martha, Sarah Beasly; to eldest son John estate left by Henry Bright, of Watertown, for money lent him many years ago; estate at Newbury left to wife by her father, Captain John Cutting. He married (first) Judith Cutting, daughter of Captain John Cutting, and (second) Sarah Cutting, sister of his first wife. She was born in 1605, according to her statement in 1658. Children: 1. John, born January 4, 1637-38. 2. James, born in 1642, died in 1643. 3. James, born August 19, 1647, mentioned below. 4. Nathaniel, born November 21,165—. 5. Samuel, born January 14, 1656-57. 6. Hannah, baptized September 2, 1658. 7. Abraham, baptized October 14, 1660. 8. Mary, born May 25, 1663. 9. Abigail, born October 24, 1665. 10. Martha, born December 22, 1667. 17 May 1637 – Admitted Freeman. James Browne, we learn from the historian, Coffin, took great interest in Governor Winthrop’s campaign for the governorship against Sir Harry Vane, as the close of the latter’s term drew near. 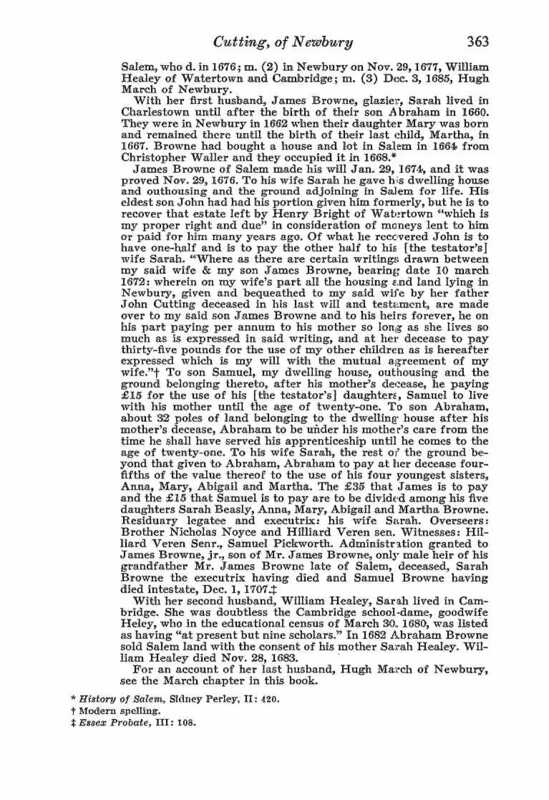 So Mr. Browne, with nine others including John CHENEY, Thomas COLEMAN, Henry Sewall Jr, Nicholas Noyes [son-in-law of Capt. John CUTTING and Cheney’s future father-in-law], Robert Pike [future founder of Nantucket, liberal dissenter, witch trial critic and son-in-law of Joseph MOYCE], Archelaus Woodman [Edward WOODMAN‘s half-brother], Thomas Smith, Nicholas Holt [future son-in-law of Humphrey BRADSTREET, and John Bartlett, .walked forty miles from Newbury to Cambridge on foot to take the “freeman’s oath” and qualify themselves to vote in the election which was soon to take place. It was by such prompt movements that Winthrop was elected and the conservative party triumphed. James wife Hannah House (Huse) was born about 1649 in Charlestown, Mass. Hannah died 18 Nov 1713 – Newbury, Essex, Mass. Sarah’s second husband William Healy Jr was born 11 Aug 1652. His parents were William Healy and Mary Rogers. William died in 1697 – Boston, Suffolk, Mass. This entry was posted in 12th Generation, Immigrant - England, Line - Shaw and tagged Charlestown Pioneer, Most Popular Surname, The James 1635. Bookmark the permalink.